Following the line of the latest posts about crowdsourcing and its use by public institutions, I’ve decided to comment a very interesting report written by Daren Brabham, one of the leading researchers in the field of crowdsourcing (just look at his paper list). 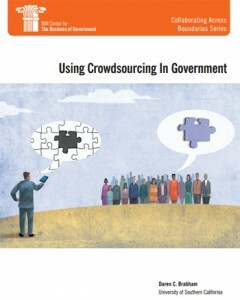 This document, entitled “Using crowdsourcing in Government”, is basically divided into 3 sections. The first one is an introduction to crowdsourcing (introduction that uses the definition proposed by Fernando Gonzalez and myself… cool…). The second describes the four types of tasks that, following the typology proposed by professor Brabham, can be performed by crowdsourcing. Namely, Knowledge Discovery and Management (e.g. SeeClickFix), Distributed Human Intelligence Tasking (e.g. Amazon Mechanical Turk), Broadcast Search (e.g. Challenge.gov) and Peer-Vetted Creative Production (e.g. Threadless). Finally, in the third part, Daren Brabham explains 10 tips that should be followed when applying crowdsourcing. This tips are grouped into three distinct phases: the planning phase, the implementation phase and post-implementation phase. Here you can see the phases and the tips or good practices that should be followed in those moments. Clearly define the problem and solution parameters. Determine the level of commitment to the outcomes. Know the online community and their motivations. Invest in usable, stimulating, well-designed tools. Launch a promotional plan and a plan to grow and sustain the community. Be involved, but share control. Acknowledge users and follow through on obligations. Assess the project from many angles. The 10 tips are important for a crowdsourcing initiative to go ahead, specially if we talk about crowdsourcing in gubernamental activities. However, I would highlight a few in particular. In the planning phase, I would highlight in particular the definition of the problem and what kind of solution is being looked for. It is essential in crowdsourcing to be very explicit about what you want the crowd to do: give some money, tag an image (indicating what type of labels), design a logo with certain characteristics … It’s easy to say that crowdsourcing can be used to solve problems, but it is not that easy to explain how do you want to implement that solution in reality. In the implementation phase, there are two important tips. In first place, to use tools (the internet platform, web or application that the crowd will use to perfom the task) well designed, stimulating and easy to use. In this regard, it is important not to reinvent the wheel. There are many tools that allow to carry out smooth crowdsourcing initiatives. On the other hand, although in any crowdsourcing initiative honesty, sheer and sensitivity are very important, in government crowdsourcing initiatives those characteristics are particularly relevant. Governments are often labeled as being very not very transparents. If a government decides to open up an initiative to the public and ask for their cooperation (regardless of the reward to be offered), in order to win and maintain their trust, government should not hide any information nor deceive them. Finally, from the post-implementation phase I would highlight user acknowledgement. It is important that users do not think that they are just a tool that after being used is ignored. The user acknowledgement, to invite the user to participate in the initiative, to take into account the users is essential in crowdsourcing. At the end of the day, the crowd is always composed of individual people who like to be recognized for their achievements.